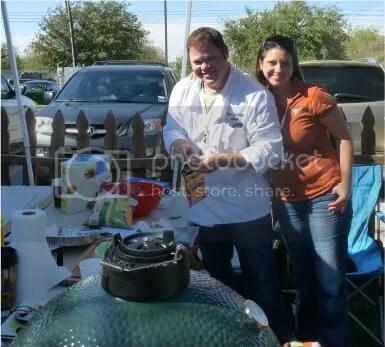 As some of you know, this weekend Stacie and I had a wonderful opportunity to participate and cook at the Plano Outlaw Eggfest. 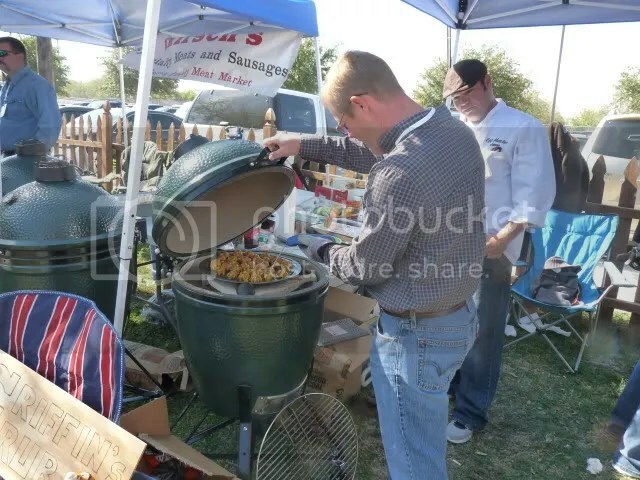 For those of you who don’t know, an Eggfest is an event where Eggheads get to showcase their talents and creativity. 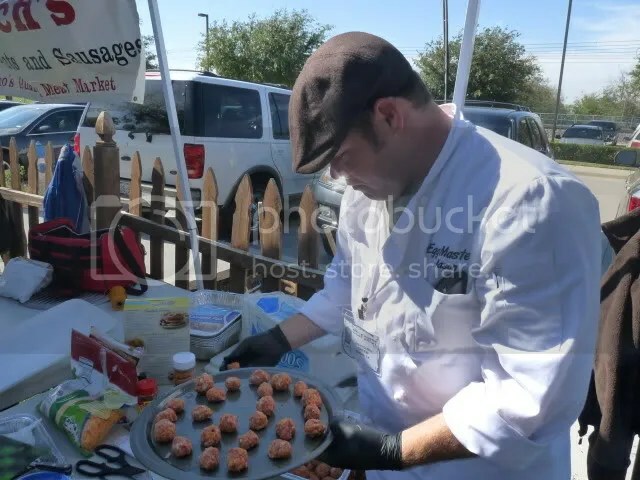 It is not a competition and you won’t normally see a lot of the foods you would normally see at a competition (such as brisket, ribs or pork shoulder) due to the limited amount of time available to cook. 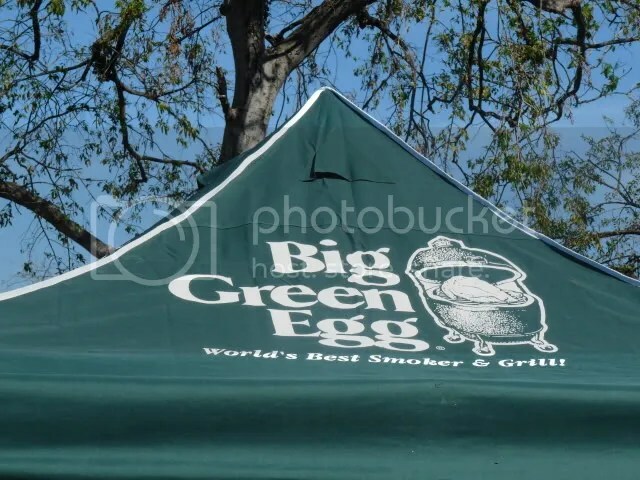 It’s also an opportunity for those who have been contemplating purchasing a Big Green Egg to meet and talk to some Egg enthusiasts and to sample the food and see what can be cooked on an Egg. We arrived at the American Legion in Plano at 9, and found many people had already shown up, set up and lit their Eggs. We quickly registered, found a spot and began unloading and setting up. 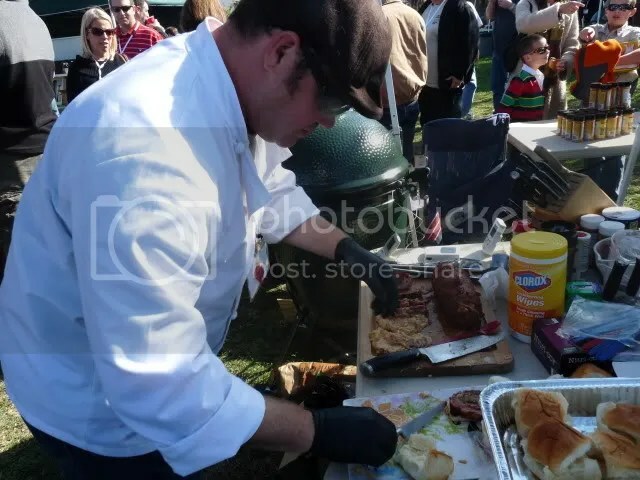 I was a little nervous about cooking at my first Eggfest and being surrounded by people who have become legendary on the Green Eggers website, but I had planned and prepped and had a game plan. Just stick to the plan, and all would go well, I told myself. My first menu item was to be a fattie (I’ll go into more detail in a later post about what that is and how to make one). I figured it was a simple cook. 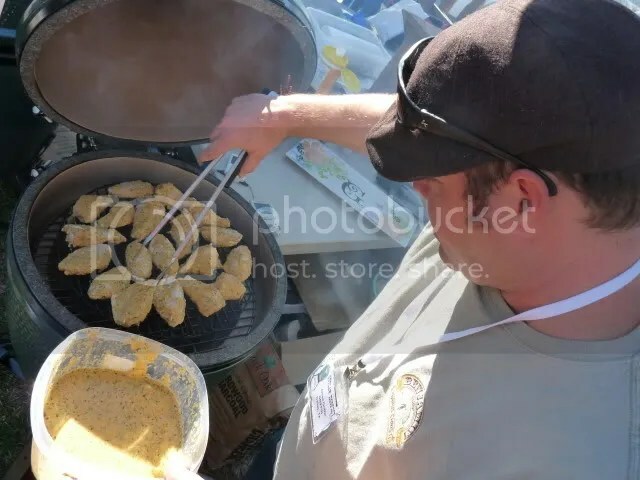 Get the Egg lit and stabilize it, throw on the fattie for an indirect low and slow cook, and we would have time to finish setting up and walk around a bit and talk. As that cooked, we did have time to visit with our neighbors and finish unpacking and getting organized. We also did walk around and sample some food. I’ve got to share this with you….somebody made a bread pudding made with Krispy Kreme doughnuts!! And it was as fantastic as you think it would be. Heavenly! 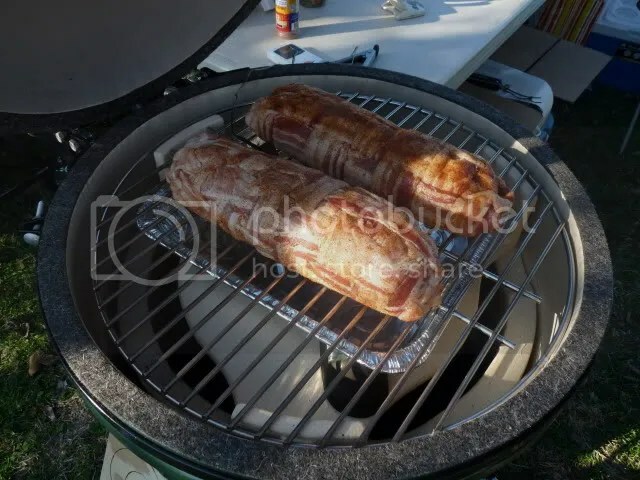 After our fatties were finished, we let them rest for a while and warmed up some Hawaiian King Rolls on the Egg to serve them on. 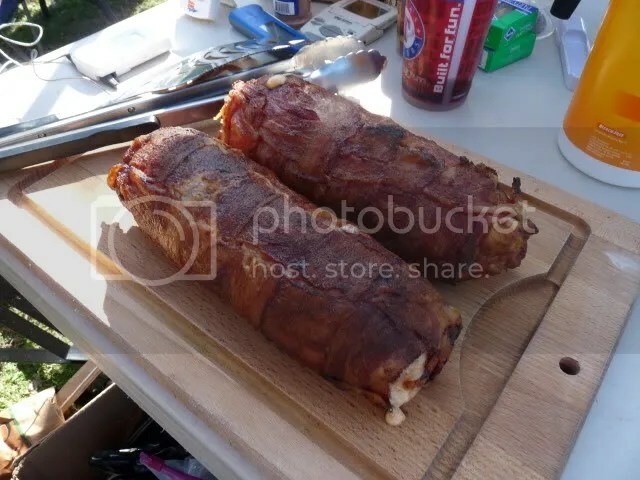 We had so many curious onlookers while we were cooking these, and they were in line and ready to get a sample. We could barely prep them fast enough. I think if we do them again, we would prep them all before even trying to serve them. They were gone in a flash and there were quite a few disappointed people who did not get a chance to taste them. To those people, I am truly sorry. I had no idea they would go that fast. Next up, we did some sausage cheese balls. We usually cook these around the holidays, as they are a tasty appetizer and don’t take a lot of work to cook. I must admit I had never tried to cook them on the Egg, but when you are cooking on the Egg indirect, it’s almost the exact same thing as an oven, only with a hint of smoke, so I figured they would work out as well. This was a quick and easy cook and I think we ended up cooking 4 separate batches. I would pull them off and Stacie would walk around handing them out, talking about the Egg and BBQ and other stuff. Really, I don’t know what she talked about, I’m just guessing here…. My parents and brother showed up to help support us and to see what all the fuss was about. My brother, even jumped in and helped out, letting me take a break for a while. 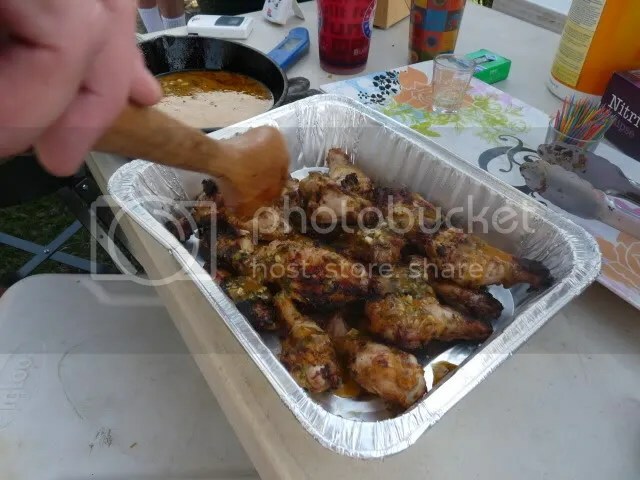 The last thing we cooked were some Piri-piri chicken wings, which we have already talked about here on this blog, so if you need the recipe of cook instructions, they are already up for review. All in all, we had a really great time cooking at our first fest. We met a bunch of great people, tasted some outstanding food, had some laughs and some drinks. But man, did it fly by way too fast. Hard to believe cooked from 9 to 3:30 straight with out any real breaks, but it was a blast! Did I mention we won a few door prizes? I’d gladly trade them all in for the Mini or Small Egg they gave away, but oh well. Maybe at the next one. I am going to post up a whole page dedicated to some of the pics that we took at the fest (over 75!!) so look for that coming soon. Thanks for looking, and if you haven’t been to an Eggfest, look it up, maybe there is one near you. I would strongly recommend going to one, either as a cook or just to walk around. Here is a link to a slideshow of all the pictures. I tried to figure out how to embed it here, but couldn’t seem to make it work. Suggestions would be greatly appreciated. Not sure if I could cook with the big boys like that. Shane, I’ve seen some pics of your cook. You could hang. I think it helped that I prepped as much as I could at home before hand (actually I could have prepped more, but I started late and ran out of time….and desire), so there was less to do on site. I also could not have done it with my loving and supportive wife, Stacie. Outstanding layout. 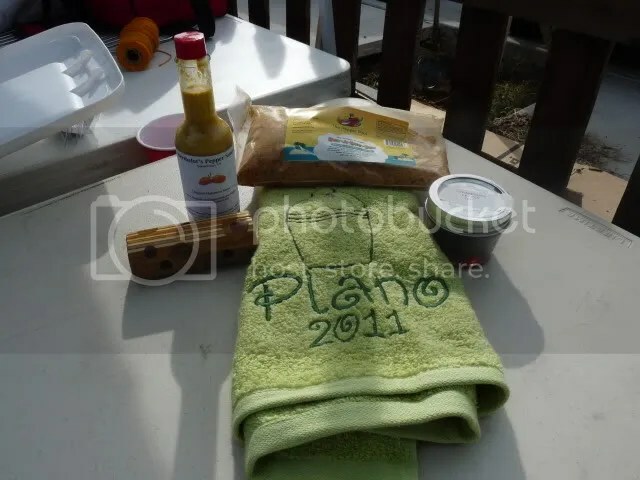 Thanks for the post on Plano. Now we expect you guys in Salado on St Pat’s day this March…. Thanks, Mickey. 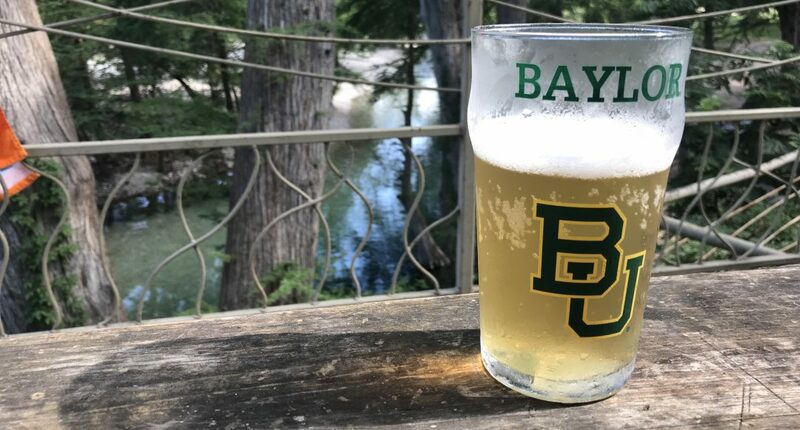 I really want to go to that one, but as I told some people at the fest St.Patrick’s Day on Lower Greenville is my wife’s favorite day of the year, so we’ll just have to see if they have the parade the same day as your fest. We did, Dyal. Would have been a blast if you could have come and cooked with us. I’m jealous of that fest you have where you got your Egg. Looks like a really cool place. Hmmmm, sausage balls on the egg…haven’t thought of that. I’ve been trying to think of something to do on the Egg to take over to Connie’s niece’s for Thanksgiving. I think some slightly smoky sausage balls might be just the ticket! It just came to me one night as I was trying to think of what to cook for the fest. I’ll post up the recipe sometime this week, although its pretty simple and you probably have your own. My secret was Dizzy Pig Swamp Venom. Looks great! 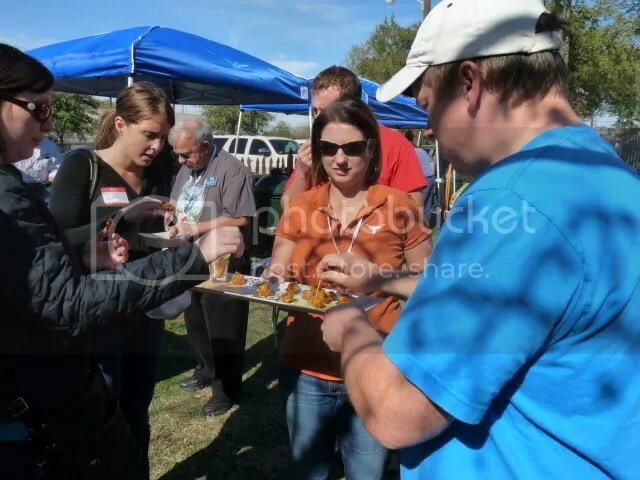 We were first-timers at EggtoberWest this year, had a great time and learned from the experience. You were smart to have variety and to keep the food flowing. The door prizes seem to be better in Plano – a mini and a small egg! Good motivation for next year! Thanks. There were a ton of dorr prizes, but we were really hoping to win either the mini or the small (as was everybody). Maybe next time.